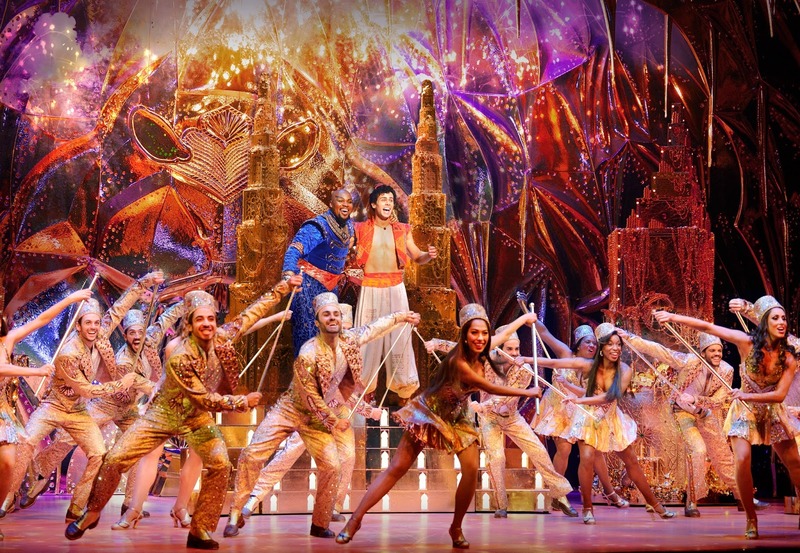 After highly successful seasons in Sydney and Melbourne, Aladdin has finally come to show Brisbane A Whole New World! Produced by Disney Theatrical Productions and much anticipated by Queensland audiences, the musical officially opened at QPAC’s Lyric Theatre on Saturday night to gasps of wonder and a standing ovation. The award-winning animated film was released two years before I was born, but I have many fond memories of watching Aladdin and its sequels on VHS tape – I was particularly partial to Aladdin and the King of Thieves. 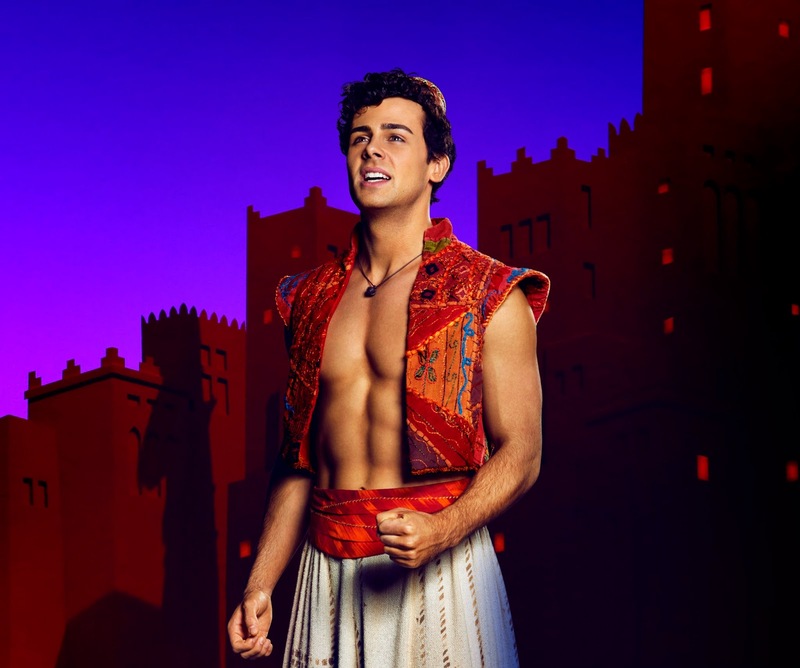 Ainsley Melham as Aladdin. Photography by Jeff Busby. Adapted from the beloved Disney film and folktales of “One Thousand and One Nights”, the tale of the genie and the magic lamp has captivated children and adults for centuries. 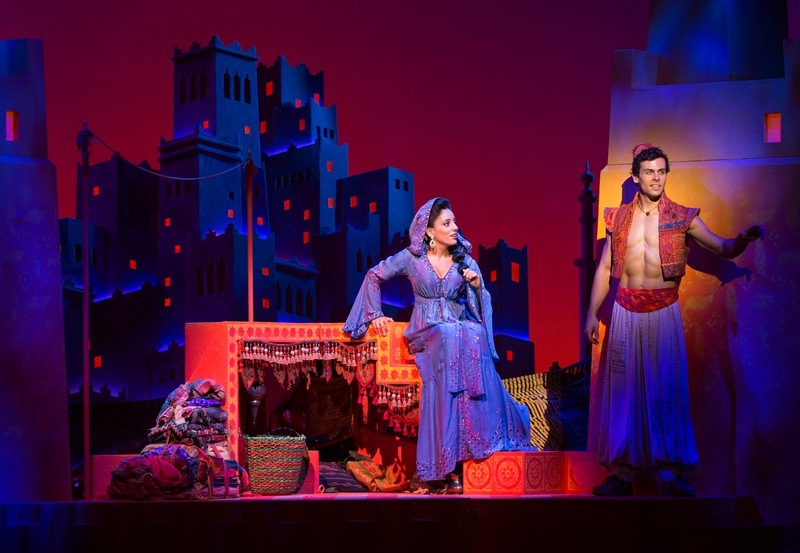 Audiences are transported to the fabled city of Agrabah where charming “street rat” Aladdin frees a genie from a magical lamp and has his wishes granted. But to win the love of Princess Jasmine, he must impress her overprotective father and outwit the evil vizier Jafar, who will stop at nothing to be the next sultan. 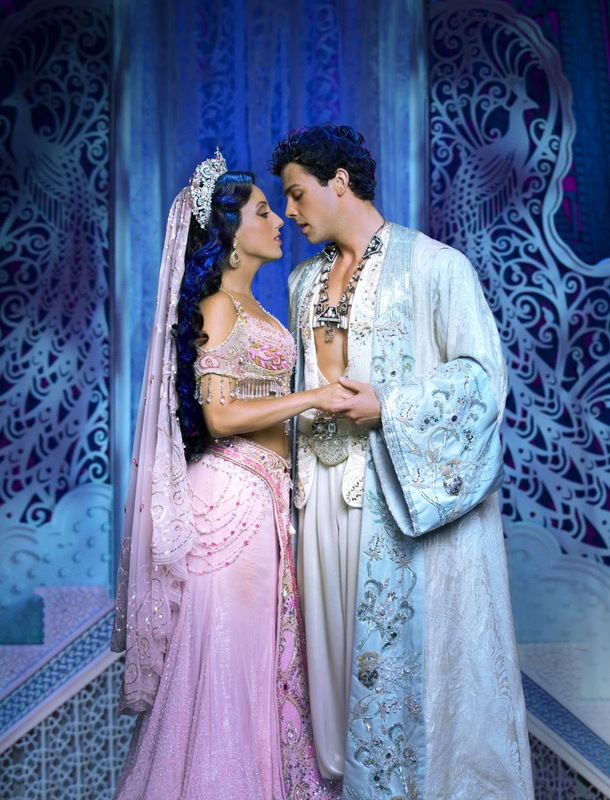 Aladdin is very much about cheering for the charming underdog, and the charismatic Ainsley Melham is a perfect casting with his beautiful vocals and palpable onstage chemistry with Princess Jasmine (Hiba Elchikhe). However, as in the animated film, it was the larger-than-life genie who stole the show. 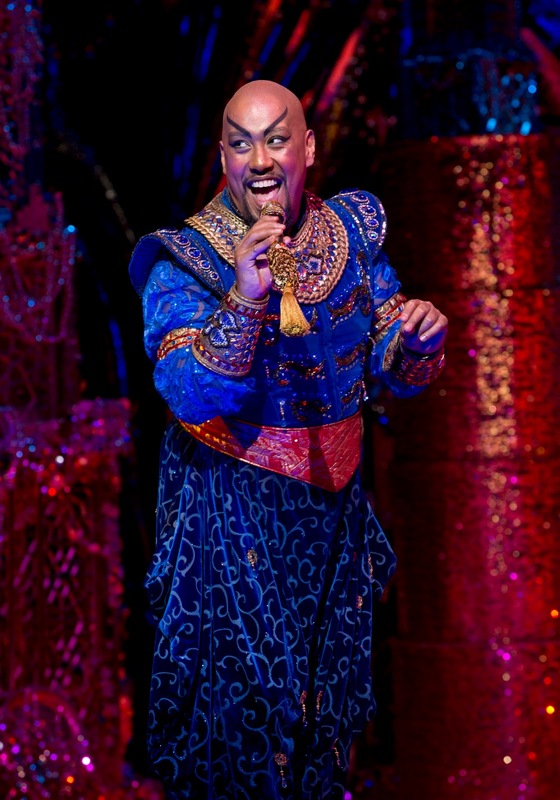 Gareth Jacobs is the ultimate triple threat in his role as the Genie – a singing voice that will give you goosebumps, excellent execution of the choreography, and charisma and stage presence by the bucket load. The Genie acts as both a character and a fourth-wall-breaking narrator, and Jacobs does it with perfect comedic timing and a hefty dose of sass. I don’t believe I’ve ever seen a standing ovation in the middle of a show, let alone in the middle of an act, but Friend Like Mewas more than deserving. 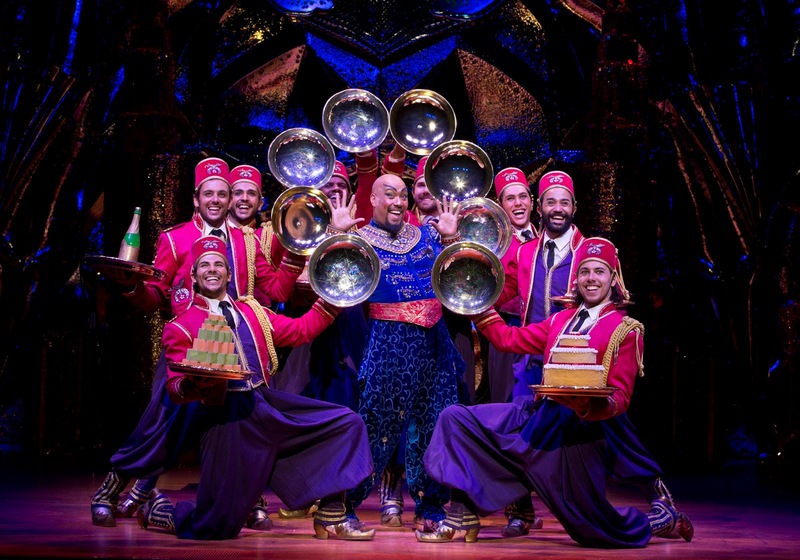 The familiar song that introduces the genie and his wish-granting powers escalates quickly into a glitz-and-glamour extravaganza with tap dancing, dramatic costume changes, and pyrotechnics. 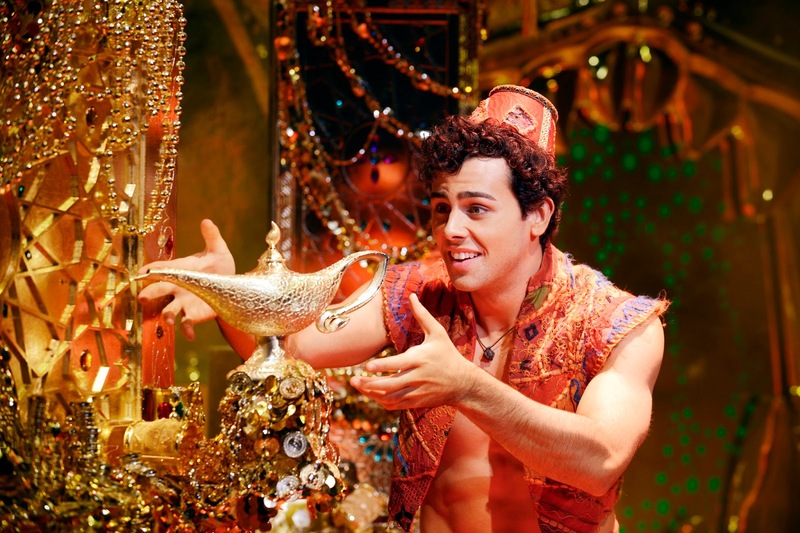 Gareth Jacobs as Genie. Photography by Jeff Busby. Aladdin’s entourage of fellow street rats – Babkak (Troy Sussman), Omar (Robert Tripolino) and Kassim (Adam Jon Fiorentino) – each have distinct personalities, and between their physical comedy and individual idiosyncrasies they breathe new life into a role that, in the film, is filled by two voiceless characters (Abu the monkey and the sentient magic carpet). It was disappointing that Jasmine’s trio of ladies-in-waiting did not get the same treatment (or even names…), but the three thieves were entirely lovable, and their musical number in Act 2 was a close second for favourite scene, and certainly my favourite song written for the musical. On the rooftops of Agrabah. Photography by Jeff Busby. Perhaps the most notable success in the adaptation from screen to stage is that the characters have been adjusted to cater to actors, and to steer away from their iconic film portrayals in the face of inevitable comparisons. Gilbert Gottfried is a hard act to follow in any circle, but Aljin Abella did a stellar job as grovelling, overexcited Iago alongside Adam Murphy’s haughty Jafar. Their synchronised evil laugh had the audience giggling along behind the back of the unknowing Sultan, played with a fumbling gravitas by George Henare. 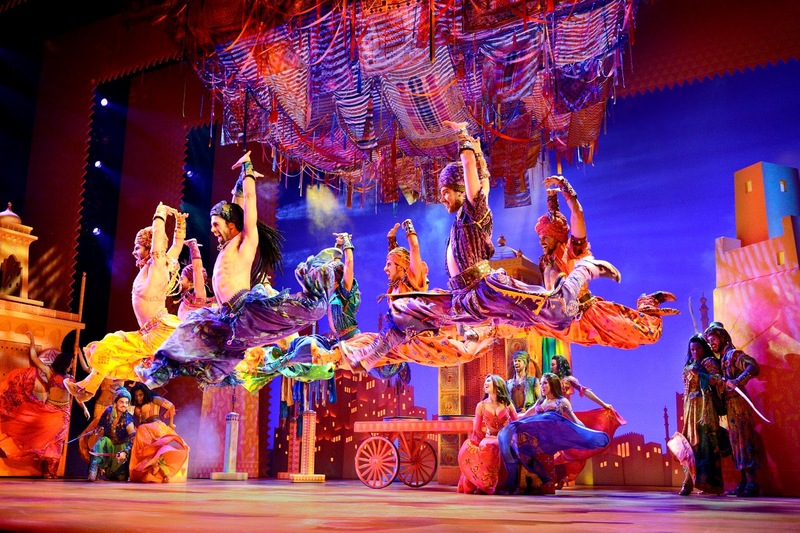 The Australian production of Aladdin features a mind-boggling 337 costumes designed by Gregg Barnes, made from over 1,000 different fabrics and almost that many different types of beads. More than half a million Swarovski crystals were used to ensure the entire stage shimmered with every movement. A royal wedding. Photography by Jeff Busby. Choreography by director and Broadway heavyweight Casey Nicholaw was very athletic and aerobic, particularly for the ensemble, and performed with high energy and flair to create a whirling world of colour and movement, although not always perfectly synchronised. Props and costume extensions like scarves were used, and the ensemble choreography was often reminiscent of old-school musical theatre. Much of the movement seemed inspired by a variety of styles, from Fosse to Bollywood to burlesque fan dancing, and the swordplay choreography was particularly breathtaking – intricate, and impressively executed. The musical includes the five songs from the film and many more, written for the musical, that will become your new favourites. Music by Alan Menken and lyrics by Howard Ashman, Tim Rice, and Chad Beguelin is supervised and directed by Michael Kosarin, who also created the vocal and incidental music arrangements alongside orchestrator Danny Troob and dance music arranger Glen Kelly. Sets designed with incredible depth and detail by Bob Crowley, lighting design by Natasha Katz, and sound design by Ken Travis transported the audience totally to Agrabah, from the alleys and rooftops of the marketplace to the sprawling expanse of the sultan’s palace. Illusions designed by Jim Steinmeyer created the extra layer of mystery and magic that really made this production a standout. Just like its beloved animated predecessor, Aladdinis an overwhelmingly magical, feel-good experience that will make your heart burst with wonder at any age. Purchase tickets on the Aladdin website, or via QPAC.